Starring Geoffrey Rush, Armie Hammer, Clemence Poesy, Sylvie Testud and Tony Shalhoub. American writer and art-lover James Lord pays a visit to Paris in 1964 and is asked by his friend, artist Alberto Giacometti, to sit for a portrait. It should only take a few days so the flattered Lord agrees. But the creative process takes longer and is more complicated and unpredictable than he could ever have imagined. It’s ten years since Stanley Tucci last stepped behind the camera: his last film as a director was Blind Date, when he also starred opposite Patricia Clarkson. 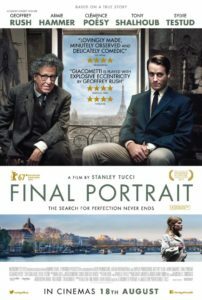 For his latest, Final Portrait, he doesn’t venture away from the director’s chair, except for writing the script. 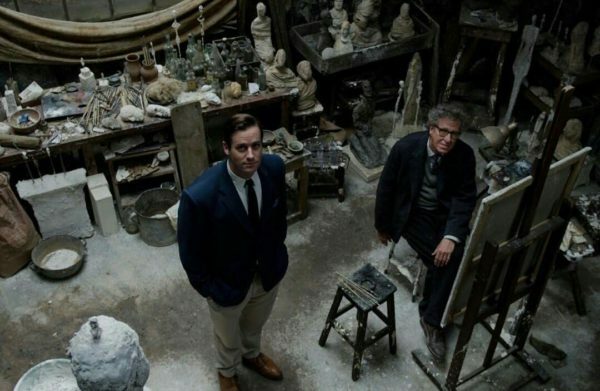 His bio-pic of the artist and sculptor Albert Giacometti (Geoffrey Rush) is no life story in the conventional sense, concentrating instead on just a few weeks and his friendship with American James Lord (Armie Hammer). Lord is intrigued by Giacometti’s invitation to paint his portrait and, as the artist says it will only take a few days, it seems the perfect way to while away a few days before he flies from Paris back to his New York home. What he doesn’t realise when he accepts is that Giacometti believes a portrait can never be completed. Which is, more or less, what happens. That, plus a huge amount of frustration on the part of both men, the painting repeatedly being scrapped and started over again, flights being re-arranged and tetchy phone calls home to explain why Lord is still in Paris. It’s all told through the American’s eyes, with Hammer’s velvety tones providing the narration, so we’re watching the evolution of his friendship with Giacometti but, more importantly, the artistic process, which is the thread that holds the film together. A process full of energy, contradiction and exasperation, one that shows the artist reaching a certain point with the portrait, then painting it out and starting all over again. Or being distracted, sometimes by his vivacious mistress Caroline (Clemence Poesy) or his stick-thin sculptures. That creative process is clearly a subject close to Tucci’s heart, reflected by the meticulously detailed way the studio has been re-created. But, although the film almost bends over backwards to generate the same level of affection in the audience, in truth art lovers are the ones most likely to feel that fascination. 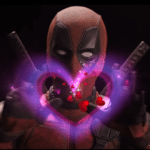 For those who don’t, it will feel overlong, leaving them wishing that the pace of the latter stages of the film had put in an earlier appearance. The result is very close to being a two hander, one which flags at times because showing creativity on the screen is notoriously difficult and Tucci hasn’t quite cracked it. But there are moments when it sparkles as well, mainly because of Rush and his angry expletives: the painting is never what he wants. 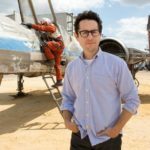 That reaction spills over into the audience because, despite all the talent in front of and behind the camera, the result isn’t quite as absorbing or satisfying as it should be. Not quite like watching paint dry, but there are moments when it comes close.